Chris grew up in Paw Paw, WV and was very active in church along with his family and came to know the Lord when he was about 8 years old. Chris went on to Alderson-Broaddus College and graduated in 1997 with a dual degree in Computer Science & Psychology. He then worked a year for the Department of Defense as a Software Engineer before deciding to go to seminary to pursue full-time ministry. 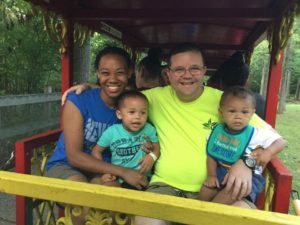 He moved to northern Mississippi and attended seminary at Mid-America Baptist Theological Seminary, graduating in 2001 with a Master’s in Christian Education & Youth Ministry. He came to New Life full-time in 2001. Chris serves as the Director of Administration and also overseas the kitchen staff and leads yearly mission trips to Brazil. In 2007, he met Johanna Scott, when she came to serve on the kitchen staff for the summer. Johanna was born and raised in Virginia Beach, VA. During her childhood years, she attended Tabernacle Baptist Church. It was there that she heard and understood the Gospel and received the Lord as her Savior in November of 1992. During her years at Tabernacle, she was introduced to Deaf Ministry. Her time there would plant a future desire to further her Deaf Education and minister to the deaf. Soon after she turned fourteen, her family moved to Puerto Rico in 1999 because her father accepted new employment. She attended Calvary Baptist Bible College while in Puerto Rico. After five years of studying there, she received three bachelors degrees in Deaf Ministries, Bible, and Elementary Education. On August 29, 2009, Chris & Johanna were married at Pennwood Bible Church. They have two boys, Joses and Eran. Chris serves at New Life Bible Camp as the Assistant Director. He overseas the Administration of the camp and speaks in area churches when the opportunity arises. They are faith-supported missionaries and rely on gifts of individuals and churches in doing ministry.